This deck is sweet, I'm looking forward to taking it to the next level as I have only been playing it for a few days so far. I started with a traditional Gifts shell and play tested games with different configurations trying to find the best one. The idea for Thought-Knot Seer was inspired by a Modern format Gifts Tron deck. After a few practice games, it was clear that Thought-Knot Seer was very powerful in a big blue deck. I played a Grixis version of the deck on Tuesday to a 3-1 finish in the Vintage Daily. The deck felt great for the entire tournament. I started out undefeated, but lost to Esper Mentor in round 4. I decided to cut red from the deck since the only card I was using red for was Dack Fayden. I built the sideboard for the power 9 tournament just 20 minutes before the event began. I decided that the Curious Homunculus were/are essentially useless but the Recoils definitely have some merit. I wanted a Blue card that dealt with big permanents like other Eldrazi. I Force his turn 1 Thorn, play a land and 2 moxes and cast Ancestral. His turn he plays a Sword of War and Peace and a Mishra’s Factory. 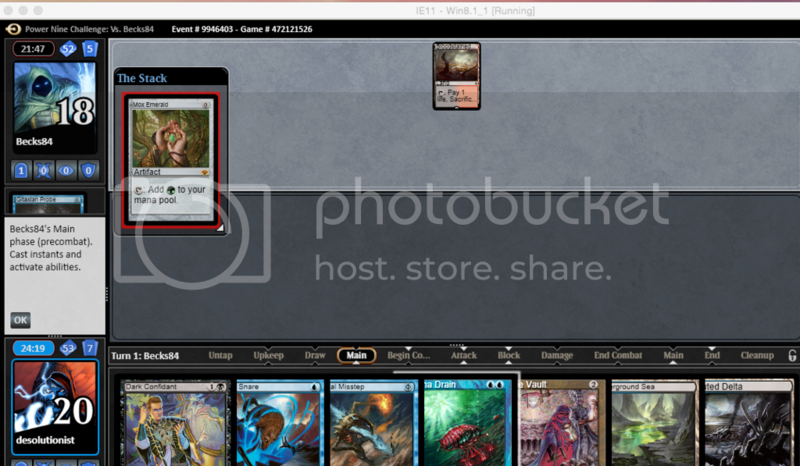 On my turn I cast a Thought-Knot Seer and take his Phyrexian Metamorph, which clears the way for the Tinker in my hand. I decide to trade the TKS with his Mishra’s Factory because otherwise I would take 10. He draws a 2Sphere from TKS and casts it. I resolve Tinker for BSC and win. he plays Wasteland, Lotus, TKS and I FoW it. I have an early Tinker again but he Metamorphs it this time. The BSCs trade and eventually I’m just in a grindy game in which I’m able to make my mana drops, counter some Thought-Knot Seers, survive under Wire, and eventually I beat him down with a Snapcaster Mage that flashbacked an Ancestral Recall. His own Ancient Tombs helped me here. He had 3 Wastelands this game and it made me realize the vulnerability of my mana base. At one point in the game, I could no longer cast the Snuff Out in my hand for free. In this game he got down a Baleful Strix and quick Mentor. I knew after seeing the Baleful Strix that I was going to have to go the combo route this game with Gifts. I played the Dark Confidant on my second main phase, which he attempted to Force. I Mana Drained the Force and Confidant resolved. On my next turn I used the Drain mana to cast Thought-Knot Seer to reveal that he only had a Flooded Strand (And two Mentors w/ Monks in play). It took me five minutes then to come up with the pile of Snapcaster, Time Walk, Tinker, Yawgmoth’s Will. I had 5 Mana, with a Lotus still in play. I was 1 mana short of assembling an instant kill with Time Vault Key and the pile that I chose was for Tinker and Snapcaster, I planned to Tinker BSC and hope he doesn't top deck. He top decked Gush, but ultimately not enough. On my next turn I played Snapcaster and he conceded. I didn’t like my hand in game 2 but it was good enough to keep. I only had 13 minutes left on the clock because of the Gifts Ungiven and I was set on playing quickly and conceding if I didn’t see a chance. 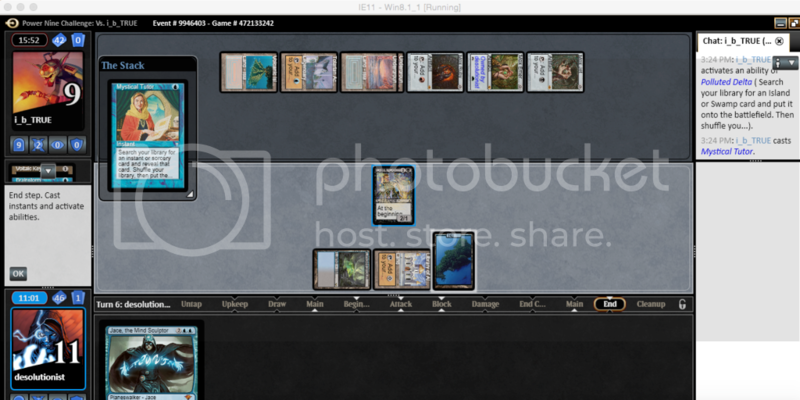 But I top decked Library of Alexandria, turn 1 (on the draw w/ 7 cards). After a few turns, my opponent just conceded. Look at this hand. I kept this. I top decked a Flooded Strand. I used my Force to defend a Mana Vault from Misstep. He then FoWed my Time Vault, but I was able to use the Mana Vault and Voltaic Key with Tolarian Academy to cast Thought-Knot Seers, which ran into 2 Swords to Plowshares. Eventually the game devolved into my Dark Confidant against his Sylvan Library. I believe Dark Confidant has the advantage here because he is essentially taking 6 life per turn. This game was weird. I didn’t get any artifacts for the entire game and just played a grindy game off of my lands and creatures. I Thought-Knot Seered him to see that he had 2 Ancient Grudges in hand!. He fought well, but eventually I won with Bob and TKS. Some more weird games. He had Orchard turn 1 to Thoughtseize my Demonic Tutor and Misstep my Ancestral. He didn’t have Oath and I had two Spirit Tokens beating down for a good portion of the game. I had a Blightsteel Colossus in play from his Show and Tell. He activated his first Griselbrand twice and passed the turn. I tried to cast Jace with Mana Drain, but that failed. I attacked and he blocked, 4 poison counters. He Show and Tells Griselbrand and draws 7. He cast Yawgmoth’s Will, Time Walk. He attacked and drew 7 cards. He could not find an answer to Blightsteel and conceded. He had turn 1 Tinker of Blightsteel and I had no response. I took a mean mulligan but scried TKS to the top, with the mana to cast it off Mana Crypt and a Mox. He turn 1 Duressed me, but my TKS and then another TKS quickly won the game. My original hand had 2 Force of Will, 1 Mental Misstep, and 1 Spell Snare with plenty of other blue cards, but no lands. I didn’t think my luck would continue with the top decks, so I mulliganed to this terrible hand. I was Tendriled immediately. At this point in the tournament, I am fatigued and develop a negative mindset. I didn't have faith in my deck in the last match. I'm in tilt and feel vulnerable. A little too much coffee. So I decide to put down the note taking and screenshots to just focus my remaining energy on playing the final, most difficult matches. I expected him to be on Grixis Therapy, but he got off the Notion Thief + Dack combo and surprised me. 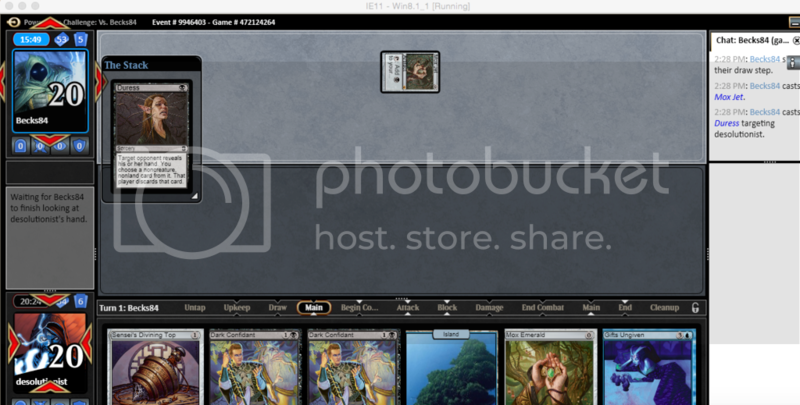 This was a much closer game than the first, but he got off Notion Thief + Dack combo again. I won quickly with TKS? Don't remember. I had a decent hand but I really needed to draw a land. My hand was Delta, Mana Vault, Dark Confidant, and some other good stuff. My plan was to play Land, Mana Vault pass. And then turn 2 Dark Confidant, hopefully drawing a land but not needing one. He stopped me cold by Strip Mining my Underground Sea. I didn't draw another land for 11 turns, but was just too far behind at that point. Thought-Knot Seer in Drain-based Blue is very good. I need to take another look at my mana base. Awesome write up and definitely digging the screenshots of your hands. Congrats on the top 8. Btw, with the inclusion of the Curious Homunculus in the SB, do you consider your deck more Tribal Eldrazi than Blue Moon? Yeah but the Homunculus is pretty bad. I just put him in the board before the tournament because the set just came out and it looked promising at least against Shops. After the tournament I tried a couple Intuition and Gifts decks with the Homunculus in the main x4 and it wasn't very impressive. For a dude that helps you cheat on mana, Homunculus is in the shadow of Lotus Cobra. I had a thought today though that Homunculus could be a thing with Wildfire since it would get the +1/+1 and survive as well as make the Wildfire only cost 3RR; he's sort of like a better Werebear from that perspective. Speaking of 3RR, If Thought-Knot Seer is good in a Drain deck without Eldrazi lands, then surely Goblin Dark Dwellers is also playable? I mean what is good about TKS is that it comes down midrange off of artifact or Drain mana, nets a +1 and then is a big body. I see a lot of similarities with the Dark Dwellers other than being reliant on the yard. @desolutionist Double red is the greatest barrier there. I could still see it in a Blue Moon style deck if you went heavier on the artifacts for Thirst. Did you kill anyone with the Time Vault combo? Yes. And when it isn't winning directly, it is forcing Gifts piles and trading with FoW+blue card. Voltaic Key is also critical with Mana Vault as a recurring mana source for Thought-Knot Seer. This list looks sweet. Is there any functional reason for snow lands in Vintage, or is it just a style thing? @Minkar In this deck, I imagine it's for Gifts piles. In one game in a match against Storm, I revealed a TKS and a Gifts, which put me in range of a mini Tendrils. In most matches, you can manage your Dark Confidant so that it doesn't kill you, but is a little less guaranteed against Storm. The Dark Confidants began in the board as something I could bring in against Gush Therapy. I brought them to the maindeck so often that I thought they were better there (Over a Dack, Mystical Tutor, and a removal spell). I thought the Dark Confidants also brought a critical aspect to my game plan, which is to beat down and ignore Null Rod. I also had been thinking that Dark Confidant was the gateway to playing Blue without Gush. But other options are emerging, so we'll see. It's very cool list you've brought there. And result is really good, congrats! I really like the idea of TKS in a big blue shell. How do you ended up with gifts there? It looks like the deck a bit heavy on 4th drops. Especially with Dark Confidants maindeck. Also how do you feel about trying a couple of sol lands like tomb or maybe eldrazi temple? It's bad against wastelands but can help vs null rod effects. Actually I had been experimenting with different Gifts shells and arrived at TKS after I saw it in a Modern Gifts Tron deck. The TKS is secondary to the strategy, but it is something the opponent may consider a primary threat. Also if you establish complete control, it's easier to beat down with TKS than it is to assemble Vault Key. TKS also races your own Bob. Dark Confidant is also secondary to the strategy so I don't worry about the life loss that much; I'm actually at 2 Dark Confidants and 3 TKS in my current build. @desolutionist Have you tested Nights Whisper over Confidant at all? I love the looks of this deck. Its the style I loved playing back in the late 2000's - mesh of combo/big blue. I'm not sure how you would get it in but did you consider cavern of souls? Name human and it makes your bobs and SCM uncounterable plus it taps for colorless for TKS - helps with all 8 creatures you want to hardcast. Cavern/mox=first turn bob. Cavern/lotus=1st turn TKS. Most other lands/lotus does not let you play tks though. No but I will and it would help this archetype if other people picked up the deck as well. I have only been playing with this deck for a week or so. I play a few games a night, making minor tweaks and adjustments. I dropped to two Bobs and am now playing a Dig through Time, so there definitely is incentive to remove Bob, although it's a great card. Shawn, cool deck. How important is Tinker to the deck's plan? Reading through your report it looks like you won a couple of games because of it in the tournament. I think one of the turnoffs of this is having Tinker and Blightsteel in here with Confidants (even with the 2 Sensei's Divining Tops). I have played Confidant in a ton of decks, and each time I play it in a deck with a large robot I inevitably frequently lose games to it (and I play Top in more decks than probably anybody). In your deck above total CMC = 101, for ACMC of 101/75 = ~1.35. That doesn't seem like a lot, but with Missteps, Mana Crypt, and so many high variance flips this seems pretty painful if Tinker-BSC is not central to the deck's plan. It seems like you won most of your games by just beating down with TKS and Confidant. You're bringing up a good point, here are my thoughts on it. I factor in taking 11 from Bob. I just assume it will happen even though it doesn't. I try to do things like keep BSC in my hand (rather than discarding it) and I sideboard out BSC often; when Dark Confidant becomes more important, or if my opponent is playing Dack Faydens, or if my opponent is playing Storm. So if Im only playing BSC in game 1, that reduces the chance of it being flipped to Bob. I don't like the idea of removing it completely, because even when I side it out the question becomes "What do I do with this Tinker"? Tinker becomes much weaker without BSC, only borderline playable, but cutting it completely weakens the Vault/Key combo, which may or may not be essential to the deck I'm not sure. What has been getting me with Diophan's Grixis Therapy deck are the two Null Rods in the sideboard. Last night I sided out Key/Vault, Tinker, and BSC. I definitely think there is viability in just beating down with Bob and TKS especially if the deck keeps losing to Null Rod. Then when I cut Voltaic Key and Tinker, Mana Vault and Mana Crypt become kind of awkward although they are great at casting Eldrazi. So as you can see, cutting Blightsteel becomes a slippery slope. I think one of the strengths of this deck, as Tom suggested, is that there are so many dynamics to it. Like if it becomes a Bob/TKS beat down deck, it would become easier to play against. @desolutionist all good points. I agree that Vault+Key are useless if not playing Tinker. I'm just wondering if those 4 slots would be better as something else altogether if this has served better as a beatdown deck, or if it is better served as a aggro-combo-control hybrid that doesn't do anything one thing particularly great. Have not yet tried TKS in a blue shell. I think Mana Crypt is still very strong even without Key-Vault, but Mana Vault I don't love anyway, because there are always so many Missteps floating around. Do you think green is worthwhile for adding Abrupt Decay (when speaking to Null Rod/Stony Silence, in particular - let alone to answer other random stuff like Revoker, Dack, Oath, etc. )?